… I just hate leaving things where I feel I misstated my position. I absolutely do not rule out the possibility that African Americans are, on average, genetically predisposed to be less intelligent. I could also obviously be convinced that by controlling for the right variables, we would see that they are, in fact, as intelligent as white people under the same circumstances. The fact is, some things are genetic. African Americans tend to have darker skin. Irish people are more likely to have red hair. (Now on to the more controversial:) Women tend to perform less well in math due at least in part to prenatal levels of testosterone, which also account for variations in mathematics performance within genders. This suggests to me that some part of intelligence is genetic, just like identical twins raised apart tend to have very similar IQs and just like I think my babies will be geniuses and beautiful individuals whether I raise them or give them to an orphanage in Nigeria. I don’t think it is that controversial of an opinion to say I think it is at least possible that African Americans are less intelligent on a genetic level, and I didn’t mean to shy away from that opinion at dinner. I also don’t think that there are no cultural differences or that cultural differences are not likely the most important sources of disparate test scores (statistically, the measurable ones like income do account for some raw differences). I would just like some scientific data to disprove the genetic position, and it is often hard given difficult to quantify cultural aspects. One example (courtesy of Randall Kennedy) is that some people, based on crime statistics, might think African Americans are genetically more likely to be violent, since income and other statistics cannot close the racial gap. In the slavery era, however, the stereotype was of a docile, childlike, African American, and they were, in fact, responsible for very little violence (which was why the handful of rebellions seriously shook white people up). Obviously group wide rates of violence could not fluctuate so dramatically in ten generations if the cause was genetic, and so although there are no quantifiable data currently available to “explain” away the racial discrepancy in violent crimes, it must be some nongenetic cultural shift. Of course, there are pro-genetic counterarguments, but if we assume we can control for all variables in the given time periods, the form of the argument is compelling. That e-mail made its way around Harvard Law School faster than you can say "WTF?" and in a matter of days, you are now reading it on our blog from the convenience of your own computer. (gotta love modern technology) At any rate, as you can imagine, this has kicked up quite a bit of fuss in good ol' Cambridge, evoking an apology from the Harvard Law School dean, rasing the level of racial tensions between Harvard's Black Law Student Assocation and the White student body who agree with Ms. Grace's position, and provoking some to call for her prestigious clerkship that she has lined up after graduation with the Chief Judge of the 9th Circuit Court of Appeals, Judge Alex Kozinski. 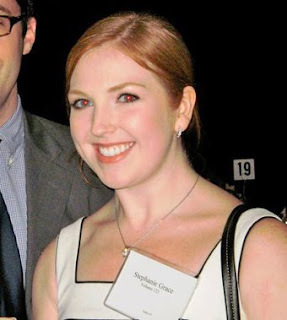 The real problem, as I alluded to in the beginning, is that Stephanie Grace is merely emblematic of a larger problem of racial prejudice in the American legal profession which is largely facilitated by the law school environment. So what am I saying - that law school creates racists? No, of course not. Anybody harboring racial prejudice like the kind evidenced above (which ranks, by my own personal law school experience, somewhere around a 5 or 6 out of 10 on the race-o-meter) surely was pre-programmed that way before they ever set foot into a law school. Law school does, however, attract, encourage and reward a certain type of personality that makes this problem far to common. Now here's where this problem effects you and I: when these sheltered kids graduate from law school, and graduate they shall, the kids with the least common sense best and the brightest students, like Ms. Grace, are selected for the most prestigious clerkship positions in the highest courts of law. You might ask what does their clerkship have to do with you? Well the answer is quite simple: judical law clerks, more often than not, are the people who write (and in many cases decide) court decisions on behalf of their judges. You might be surprised to know that the big headline court decisions that you read about in the papers are usually not written by Judges but rather by their clerks. The Judge, who can't be troubled with such trivial things like legal research and writing, usually entrusts those duties to their clerks who, in turn, inform the judges about which way they should decide on cases. (Every now and again, you'll get a judge who does his or her own research and writing, but not too often.) Now at the trial court level, the decisions of a law clerk may only effect the rights of the few people who come before that particular judge, however at the appellate court level (like the one Grace is about to go to) one clerk can literally shape the law that will effect millions of people. If a major case should happen to come across the desk of a clerk like Grace involving a law that discriminates against Blacks, it doesn't take a geneticist to see how that case will turn out. Thus, I submit to you that the real problem is not that some random third-year law student wrote a racist e-mail, but rather that she represents the rule as opposed to the exception when it comes to racial ignorance in the American law school experience.